Dorje is a Tibetan word referring to a ritual object held in the right hand of a Lama while preforming religious ceremonies. As a sacred symbol of Tibetan Buddhism, the Dorje represents the ‘thunderbolt of enlightenment’; an abrupt change in human consciousness which is recognised by all the great religions as a pivotal episode in the lives of mystics and saints. Dorje is a common given-name for men in people of Tibetan culture. The Tibetan people believe that giving a child this name lends him a spirit like one of an isolated Bodhisattva who helps humanity from afar. The Dorje also represents the unity possible between opposites. In the Buddhist religious ceremony, a bell, symbolizing the feminine principle (the wisdom of emptiness), is paired with the dorje, symbolizing the masculine principle (that of compassion expressed through skillful means). The union of these two principles is an enlightened mind. 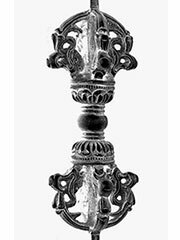 Vajra is the corresponding Sanskrit word referring to the Dorje.